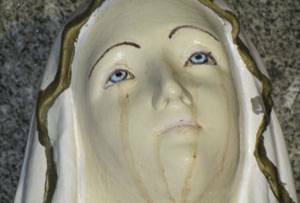 Solex Mal Universal Language: The little Virgin’s statue crying blood and the Faith!? On the contrary, as I always say, the statue of weeping eyes, weeping feet, or both -not being a technician to verify the authenticity- there is the relationship of the facts which unites not a coincidence, and if it were, always induces us to meditate, deduce, determine, precisely in something programmed by a HIGHER WILL. The statues, pictures, are many in the world who appear with these CLEAR SIGNS. In prudence, not to be confused with the CATHOLIC prudence, THE POWER OF TIME, that has nothing to do, we know that these signs exist, and how ...!!! And between those signs there are also the traumatic ones.. To strengthen an episode that can relate, like today, a NOT COINCIDENCE with another...! In fact SANTA FE ... which means THE HOLY FAITH ... "FE" IN SPANISH TRANSLATED IN ENGLISH "FAITH" ... SOMETHING THAT THROUGH THE CRY OF THE VIRGIN MOTHER WANTS TO recall ... "FAITH" ...? Nothing is more extraordinary, if then we see what David asks us, we can safely, not coincidentally associate both. David from Torino: Filippo I'm sorry ... I'm Catholic, but slowly I feel more and more attracted to these cosmic knowledge, which I think should allow us to have a different view of all that we have been taught. But what do we know, what were we told by these Extraterrestrial Beings about FAITH ..!? What is in these teachings..!? Filippo: That's what has been said through Eugenio, and what happened in non-coincidence with an extraordinary event that happened in Argentina and published on 12-04-2012. In truth, who of you know the reality of this titanic force acting consistently in the sensitive hyper physics structures of your soul? Faith, indeed, is an inner talent, that places, at every moment, the residence of the spirit in a possible phase of self-realization of the edifying forces of the Eternal and Divine Being who stands in that manifestation. Faith is a true balm able to shake the sleep of the one who is immersed in the dreams of the life and work of the limited space and time. Who had faith and through it believed, will build in life, certainly, will realize that invisible bridge between the relative and Absolute Being on all limited things to unlimited things. In front of the pure faith, the barriers of space and time cease to exist because it is true that spirit, then, will be raised in its true glory. This is what you have to say, who has wisdom and knowledge, understand. You must bring all your good will to prevent succumbing, of being inexorably drawn by the dark forces of rampant evil. You know very well that you are involved in a great battle of good versus evil, and you know, also, to be in the good graces of the Christ militia, which is present and active. The spiritual power is always present, and your unwavering faith. It 's true that there will be a very difficult time and it's still true that many of those called will be tempted until the spasm. But do not be afraid to stand firm and make sure that you never will unless the consolation and vivifying of the Omni creative Light. Continue on the path that you have been placed, by divine will, depend on the will that you exercise at the moment that evil decides to possess you. If you doubt or loose your faith, your salvation becomes impossible. Then your call remains free of election and your destiny, the darkness. Strive to find out what is secret on you. You need to find out, what has been given to you, you must do it yours at any cost. You have to dig into you, even if the suffering surrounds you and you are violently hit. God’s gift is not simple and easy to conquer. If you want to have the right to be free and enlightened by the Truth, you must first of all be full of faith and endure, without suffering, the duty to which you have been called to get rid of ignorance and be ready to give yourself without limits and without conditions. If fear assails you, and it wins you, you will not find anything .The faith is the lifeblood of hope which precedes you and gives you the necessary strength to overcome the trials of today and the achievement of the tomorrow’s joy. If you will be strong today, tomorrow you will be less vulnerable and more and more strengthened in the spirit until you discover what yearn to know to be in the Truth and Free. The Appearance of the Immaculate Conception.